Brooke Meyer is a Manager at IAALS with a focus on our work in civil justice reform at the state and federal levels. 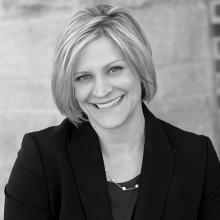 Meyer joined IAALS in 2019 after having litigated in the public and private sectors for approximately 15 years. She began her legal career at Baker & Hostetler’s Denver office, where she focused her practice on products liability litigation defense. Brooke then transitioned to the Colorado Attorney General’s Office where she represented state agencies in employment matters and litigated civil rights matters on behalf of the Colorado Civil Rights Division. From there, Brooke moved to the Colorado Supreme Court Office of Attorney Regulation as an Assistant Regulation Counsel, where she handled attorney diversion and disciplinary matters. Meyer graduated from the University of Denver Sturm College of Law in 2001. She received her Bachelor of Arts in International Relations from Emory University in Atlanta, Georgia.